Happy St. Patrick’s Day! I am celebrating by sharing my favorite Irish recipe with you! You can’t go wrong with a good pie! I’ve made many pies in my life. Some were good, some were just ok. Can’t say I have every really had one I didn’t like. I’ve had different versions of Shepherd’s Pie. I remember when I was younger my mom made her own version of the pie. I always called it ‘Leftover Pie’ because all the meat, potato and vegetables in it were from the leftovers during the week. I guess that was one way to get rid of those pesky leftovers! Mom’s pies didn’t ever disappoint either. I think its pure magic how someone can just toss some leftover in a pan, add some spices and something simple and it turns out to be a wonderful meal. I have been able to create some of my own leftover meals, but they just don’t compare to moms. Shepherd’s Pie isn’t a easy-to-find menu item at restaurants around here. I know places in the state serve it, but nothing close. The few I have tried were not very good. When the hubs and I went to Niagara Falls and stopped a few miles across the border in London we had Shepherd’s Pie. On the way back, we stopped in Sarnia, ON which back’s up to Port Huron, MI. While both places were pretty awesome, Ups N Downs had the best flavor and texture. I’ve been trying to produce something similar knowing St. Patrick’s Day was right around the corner. I’ve been practicing. Husband even tried his hand at pie making over the years, but I have to tell you, this particular pie had to be the best Shepherd’s Pie that not only have I made, but have I eaten. I did try to find some lamb to make this traditional and both of the stores by me didn’t have any. I am not a huge fan of eating lamb so this didn’t bother me at all. It just so happens that this is another adaptation of a recipe found in Irish Traditional Cooking by Darnia Allen. I tell you what, that was the best cookbook my mom ever gave me. I have a ton of cookbooks but this one has been such an invaluable tool these last few months. It’s really getting a lot of use. I love that the cookbook has little history blurbs in it too so that when kiddo and I decide to try something she gets a bit of history to go along with it. 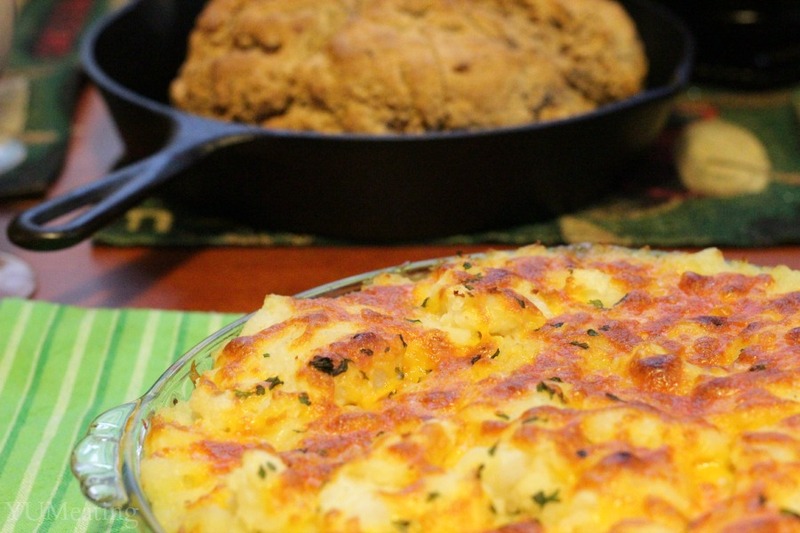 We paired this meal with the Traditional Brown Irish Soda Bread. The pair go very well together. My favorite part is the golden layer of cheese. How it melts in my mouth when I eat it. My mom does this with her mac and cheese and it’s my favorite part! Have you ever had Shepherd’s Pie? Did you enjoy it? Have a favorite way it’s made? I would love to hear about it. Please drop me a line in the comments. 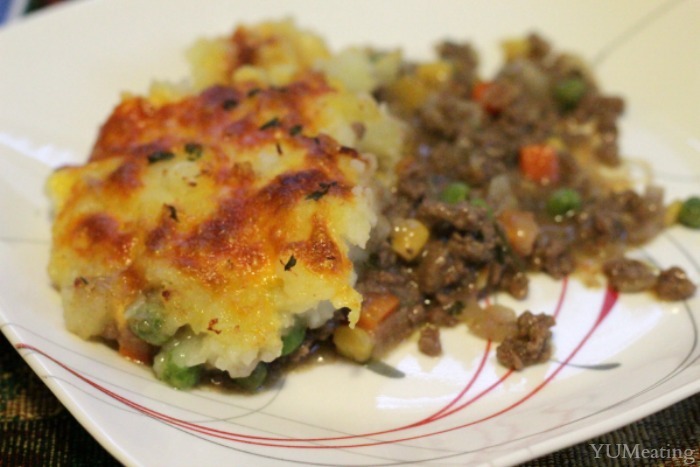 Adapted from (pg 111) Traditional Irish Cooking's Shepherd's Pie by Darnia Allen. In a large pan boil the potatoes. Put 1 tbsp of butter and onions in the bottom of a dutch oven and saute them until tender on low heat. After about 5 minutes of cooking the onion add the wheat flour. Pour in the beef stock and bring to a boil. While waiting for the stock to boil, in a frying pan add the ground beef and cook on medium-low until brown. Add the peas, carrots and corn. Stir well and cook with beef for an additional 3 minutes. Be sure to use a spatula to mince it into small pieces as it cooks. When your beef stock comes to a boil at the tomato sauce, parsley, thyme, salt and pepper. Cook on low for 5 minutes. When potatoes are done (they will be tender when poked with a fork) drain the water. Add ¼ c milk and 2 tbsp butter to the potatoes. Mash using a hand masher and then set aside. When your beef is done cooking pour the meat mixture in with the onion mixture. Remove from heat and place the mixture in the bottom of a large pie pan. Cover with the mashed potatoes. Cover with the shredded Irish cheddar cheese. Place under the oven broiler until cheese is melted golden brown. This looks good. I will have to try this version out on my family. Basically, anything topped with mashed potatoes will be devoured! It’s the same thing here! Add potatoes and away they go! Tripling this sentiment. I’ve got some potato loving folks in this house! 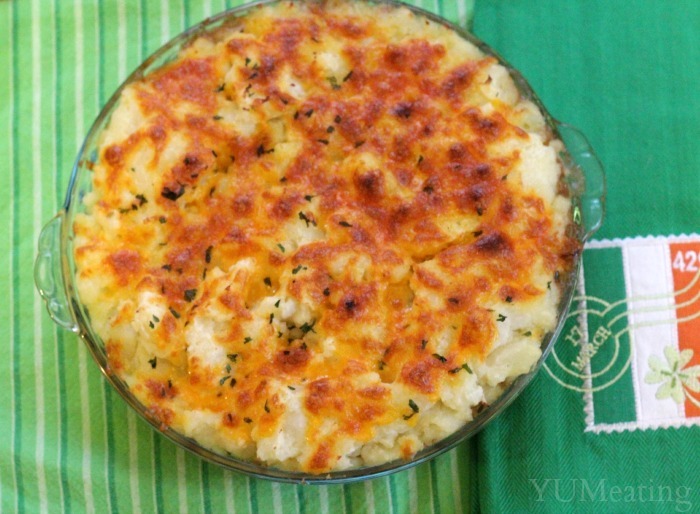 I haven’t found a shepherd’s pie recipe that i love yet, so I’ll have to try this one! Thanks for linking up with the Tasty Tuesday’s Link-up. I have pinned your post to the Tasty’s Tuesday’s Pinterest Board! I have tried many and so far this one is my fave. Once March is over I am going to teach myself Scotch Pies. I’ve only had shepherds pie a few times and have been looking for a recipe to make one myself – this looks absolutely delicious! Thank you, I really hope you enjoy it! This looks really yummy! Shepherd’s Pie is one of my favorite dishes. It’s so hearty, and it’s perfect for cold weather. This recipe looks delicious. My husband loves shepherds pie so I will have to try this! What a yummy recipe 🙂 My family isn’t much into Shepherd’s Pie but it’s always a good time to try. 🙂 Thanks for sharing! I have never tried Shepherds Pie, but have always wanted to. It has all of my favorite things in it. This looks soo good! I’ve never had Shepherd’s Pie before but I’ve always wanted to try it! Looks like this recipe will get me to! My sister in law used to make this all the time and the whole family loved it. I made it once using her recipe YEARS ago. I should try it again using your recipe cause it seems to be a little different. I know my husband would appreciate it. Oddly enough, I can’t say that I remember ever eating Shepherd’s pie before. I’m familiar with it, but I’ve definitely never made it. Maybe I’ll give it a go this St. Patty’s! When I was my childhood I really don’t like sheperds pie. But now that I’m a mom of two boys this one of my favorite pie ever promise. Of course I’ve tried it and loved it! I’m almost 100% Irish! But no one has ever given me a good recipe. And belive it or not, I seriously just asked a chef pal of mine to find me one…now I have one! I’m not much of a shepherd’s pie girl, but this looks yummy. Gotta try it! This Shepherds pie looks and sounds amazing and I will have to try this recipe. My son loves my shepherds pie and I think he would love this one too. Thanks for sharing this recipe. We love Shepherds Pie, but we have never made it like this. I am bookmarking this today for next week! Thanks for sharing. We make a very similar shepherd’s pie. That’s definitely one of my favorite foods. That looks delish. My husband loves shepherd’s pie. I never thought it is that easy to make. We’ll try it one of these days. This looks like a delicious Shepherds Pie recipe. I love to make Shepherds pie it is a great meal. The kids love it. Oh wow, this looks amazing! I think I know what’s for dinner tonight! Yum! I love Shepherds Pie! I can’t wait to make this for St. Paddy’s! As much as I like sheperd’s pie, I’ve never tried to make it. This look delicious. Maybe I should give it a shot. I love shepard’s pie but not with lamb so I’m pretty pleased to see your recipe without it. I left a comment on your Waltzing Weasel post. I’ll have to try your recipe. I’m not sure where my comment just went. I love Shepard’s pie but I don’t like lamb. Nice to see your recipe has not. I also left a message on your Waltzing Weasel post. This is looks delicious but I never tried to taste it, someday I’ll make it thanks for this wonderful recipe. Mmmm your making me hungry over here! I will certainly print this recipe and make this soon! Shepherds pie is such a good dish to enjoy on chilly days. This is a good recipe for one. 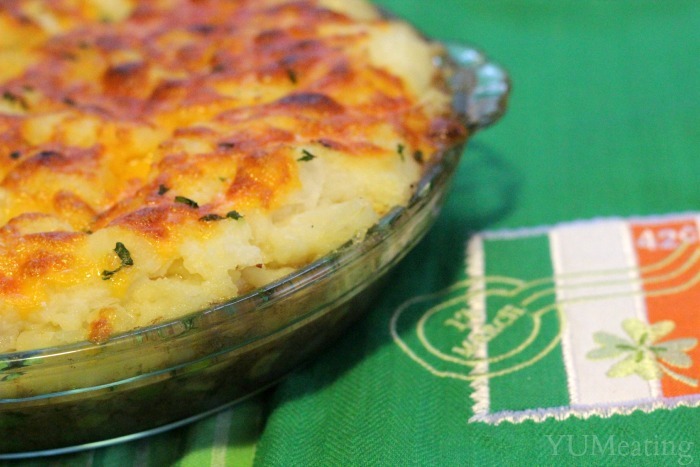 You have inspired me to make shepherds pie for st. paddy’s day this year. i hadn’t thought of it before but it makes total sense. Great looking recipe! I haven’t had Shepard’s pie in years–I really need to add this back to our menu because I’m sure my boys would love it. Omg I absolutely love shepaherds pie!!!! This is one thing I do not have my own recipe for so I may have to try yours out! this looks really yummy – fulfilling and delicious to eat- yumyum!